On April 8, 2016, Prof. Frank J.M. 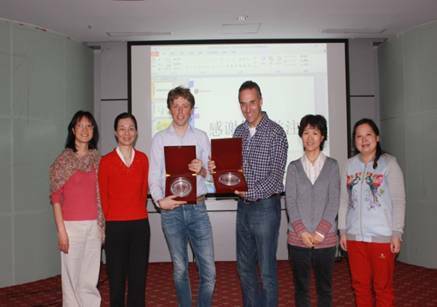 van Kuppeveld and Prof. Berend Jan Bosch from University Utrecht paid a visit to WIV. By the invitation of Prof. Xinwen Chen, both of them gave excellent oral presentations on “Picornavirus Replication and Antiviral Drug Development” and “Coronavirus Entry into Host Cells” respectively on an academic seminar. On the seminar, Prof. Kuppeveld talked about his work and progress in study on picornaviruses, and Prof. Bosch talked about the entry of coronaviruses into their host cell and cover topics dealing virus-receptor interaction, membrane fusion, structure of the spike protein and its implication for development of intervention strategies. Scientists in WIV discussed the related areas with them thoroughly and we believe that the ongoing cooperation between University Utrecht and WIV will be further deepened.